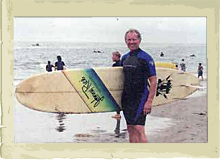 Former Senator Bruce McPhearson after a paddle out for Surfrider's Clean Water Act in Santa Cruz. 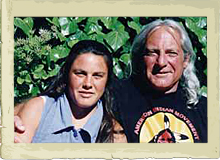 Rosemari and Johnny just after the Clean Water Act paddle out. 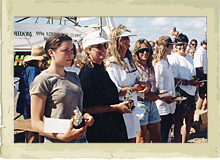 Rosemari, second from the left, after a contest in West Port Washington State. She was in her 50's at the time. 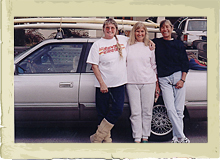 It was an open age contest with the youngest surfer being 14. 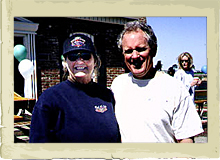 Rosemari and Sen. Bruce McPhearson in front of the Santa Cruz Musuem. The girls Rosemari, Earleen Colfer and Betty Van Dyke in front of Betty's house on 38th Ave.
Beth Pitts with Johnny. She was a real special person and went to Heaven soon after this was taken. 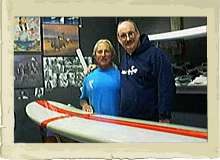 Team Rider, Nate Pierce with Johnny just after Johnny built him a new board. 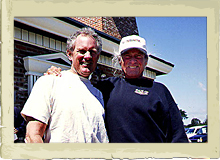 Sen. Bruce McPhearson with Johnny. 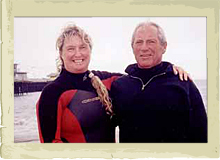 Bruce soon became California's Secretary of State. 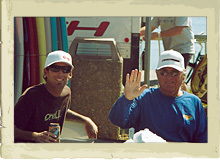 Ray Pierce (Nate's dad) with Johnny. 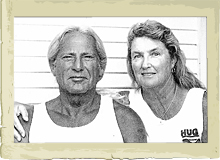 Johnny and Rosemari – a picture taken by Marcia Schatan, an old friend from high school days. 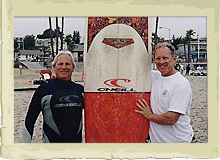 Sen. Bruce McPhearson and Johnny just after the Surfrider paddle for the clean water act. 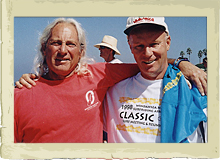 Johnny with George Laning at the Wind-N-Sea contest in LaJolla, California. 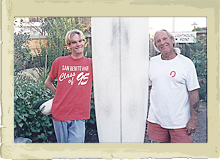 Johnny and Chris Ahrens, a writer for the Surfer Journal and has many books published. 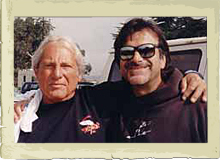 Johnny and Jason "Rat Boy" Collins at the Santa Cruz longboard contest.